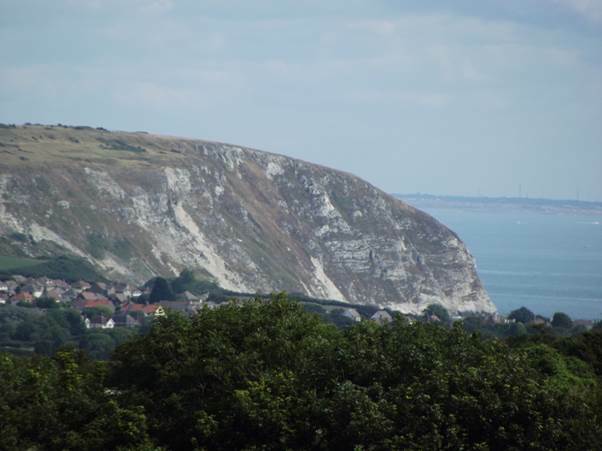 Dancing Ledge is near Swanage. We sometimes go there to enjoy a bit of wilder scenery, although in truth what we head for is a stone quarry. 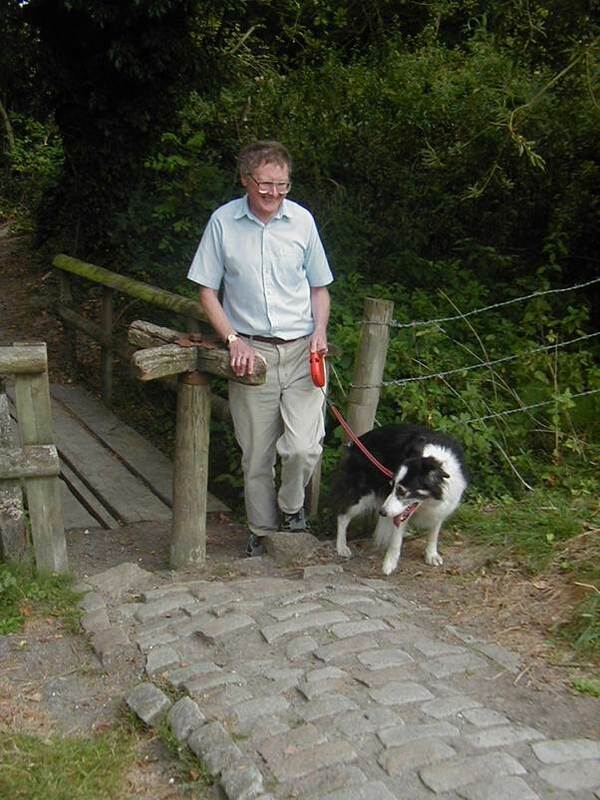 It is quite a steep step down from the car park which, perhaps, makes it not such an attractive destination for some. The high up car park gives a view across Swanage to Ballard Down. The climb down is rich in all sorts of interest. On this August 2013 visit, the blooming flowers may have been ordinary, but still lovely. As you work down there is lovely coastal scenery. The right hand end of the high hill has clearly been terraced for agriculture in the long ago past. 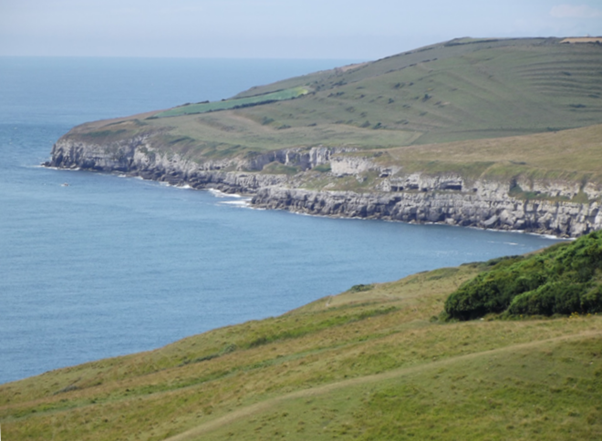 The Dancing Ledge is a large flat area, next to the sea which has been left by quarrying. The quarry also left cliffs which are much loved by rock climbers. I prefer the flatter areas – the Ledge itself. What goes down to Dancing Ledge must return back up the hill. There’s plenty of opportunity to rest and enjoy the view. And always flowers to enjoy – sometimes with insects. Back at Christmas time I commented on a coaster my wife was given – a coaster which featured a Tamworth sow. I told a little of the story of the Tamworth sow we had kept for a work colleague of mine – a chap who had to go for cancer surgery. It was not an easy pig for us to keep. This young girl proved adept at high jump and she could easily vault out of our pigsty, even when I added an extra layer of blocks to the wall. She was also a powerful weight lifter and could happily lift heavy steel gates off their hinges and lay them down flat before setting off for escapades around our village. Back when I wrote about her, I had really quite forgotten just how long ago it had been since our time with the Tamworth one, but I was recently looking through photos for something else and came across pictures of her. It was 1990 which, it scares me to think, is now 25 years ago. And there she is, with me offering her some food. By this time I had learned that an electric fence was the only way I could keep her in. Our Tamworth was tamed by one electric shock and then knew to keep her distance from the netting. 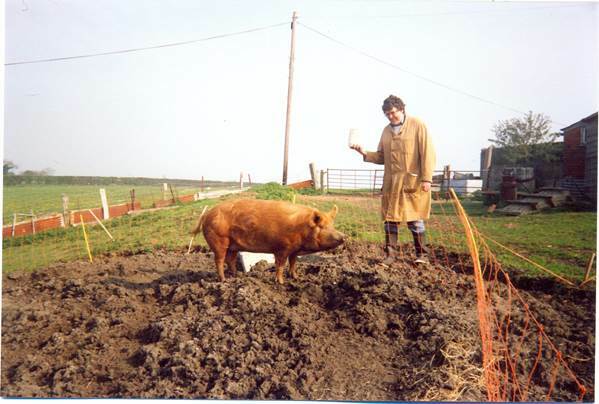 She settled down to doing what pigs do, which is to be a kind of living plough, rooting through the soil. 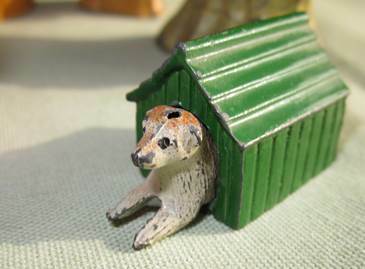 Lest anyone worries, she had a pig ark to offer shelter from wind and rain. Being solo probably wasn’t so good and she loved human company. Yes, she was quite cute when she wasn’t escaping and terrorising the village. 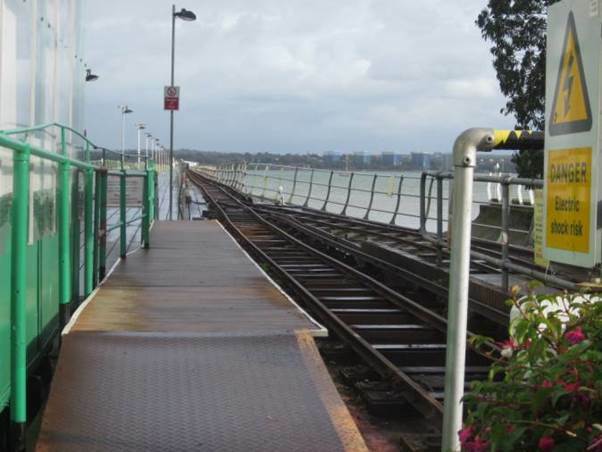 Now here’s a little railway in Sussex which I never knew. It opened, under the direction of Holman Stephens in 1895. It was closed on the outbreak of war in 1939 and never reopened. I have a little book about the line, given to me by my father. Peter Harding had this book published thirty years ago, in 1985. It is well illustrated; the little line was clearly well photographed. 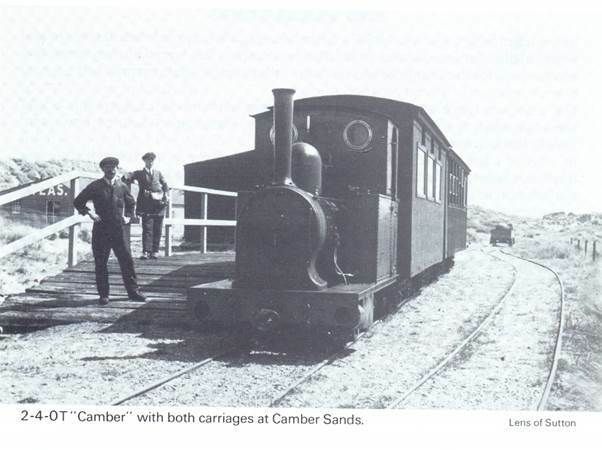 Here we see the steam loco which was called Camber. Perhaps we can gauge the lack of local population from that photo. What makes the book special for me is that my dad put a record card in it. Dad’s writing was never easy so I’ll transcribe. 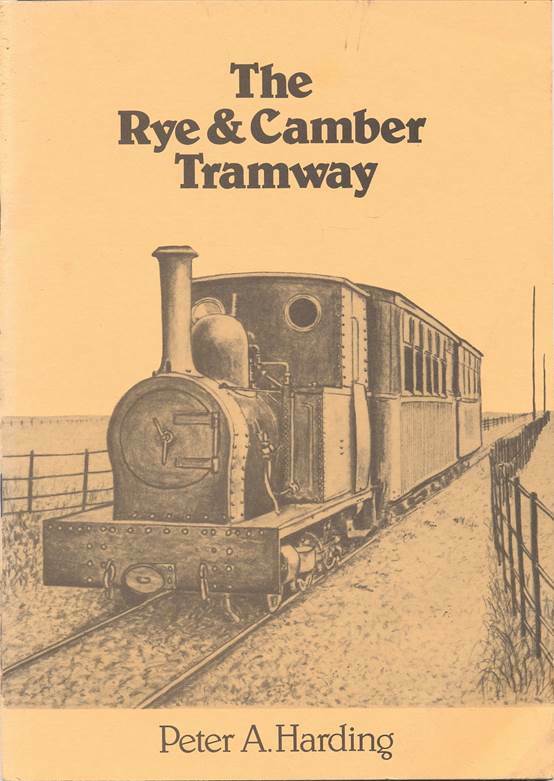 I travelled once only Rye – Camber – Rye around 1930. A Sunday School treat took us to Rye and as there was not much for a 9 or 10 year old we spent some of our scarce pocket money on the train. There was nothing to do at Camber either so we came back. I should have remembered an antique steam engine and am fairly certain that the train was petrol hauled. So presumably Dad was hauled by this little beast, illustrated in the book. What fascinates me is that such an antiquated form of transport was still in operation within living memory – for people over 80. Actually, a future post might show a similar loco still in operation. 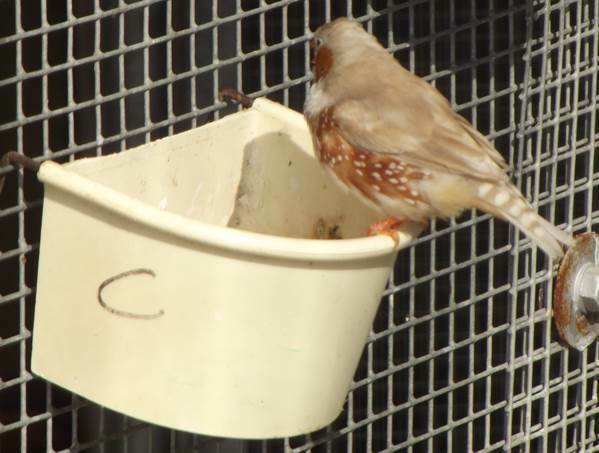 The park in Devizes, known as Hillworth Park has had an aviary with pretty birds in it ever since I have lived in the area – and that’s 45 years. The park was recently revamped and is much more of a place to go than it used to be. The birds are still there and were given a splendid home. I don’t really like caged birds, but these have space to fly, to nest, to be on their own or with the crowd so I guess it isn’t an unpleasant environment for them. Of course they are well fed so one might say they don’t have a care in the world. From time to time we took our children to see the budgerigars in the park. Now we take grandchildren and there is a wider variety of birds. Let’s start with a zebra finch. All photos have to be taken through that hefty mesh. If your lens is large, the trick is to put the camera lens right on the mesh. As if by magic, the mash bars seem to vanish. There is one in that picture which shows faintly as a very blurred grey area. You can see it above and below the letter C on the feed tray. 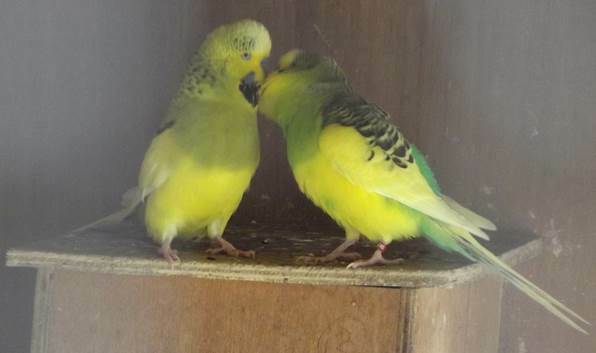 Love birds or budgerigars? The out of focus metal bars show up at left and right side. I could call it a form of vignetting. This is a variety of sparrow. The aviary has a good board telling you what the birds are. My memory failed on that one. 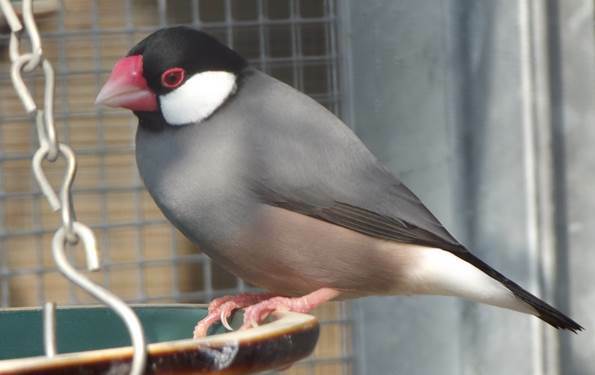 Is it a Java sparrow? There are ground level scavengers in the form of pretty chickens. The board said they were silkies but I’m certain this is not a silkie. Granddaughter enjoyed the birds – just like her dad and aunty had a generation earlier. 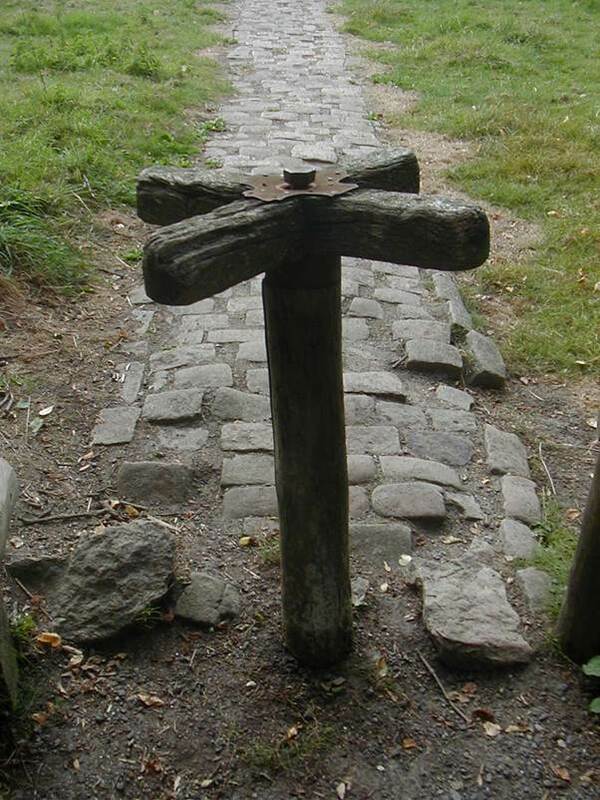 No doubt many of us older folk – not that we are that old – had farms where the items were cast in metal. My wife had an altogether classier set of kit than I ever had. Some of her bits of farm are really lovely. Here is some of it. 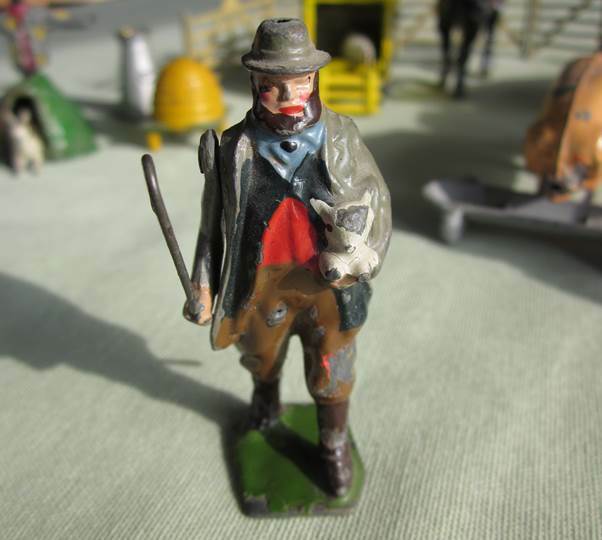 Like many a farm, gathered together in an ad hoc manner, it isn’t all to scale. The delightful round haystack is not much bigger than the stooks of corn. Some of these individual items are just grand. 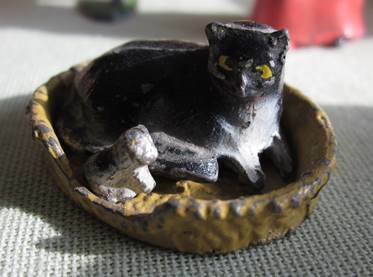 How about the farm cat, in a basket with a kitten. His sheepdog waits patiently in his kennel. 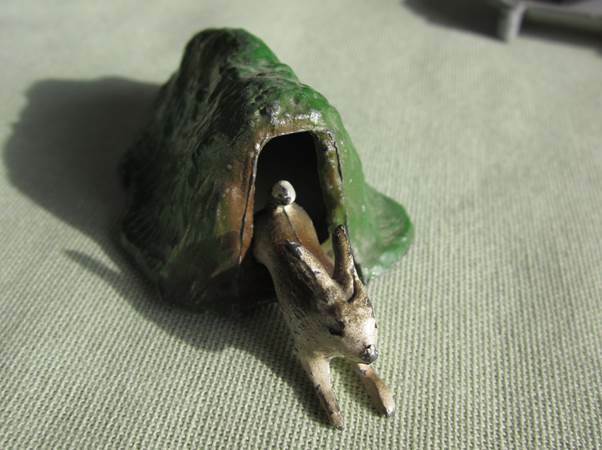 A rabbit emerges from its burrow. 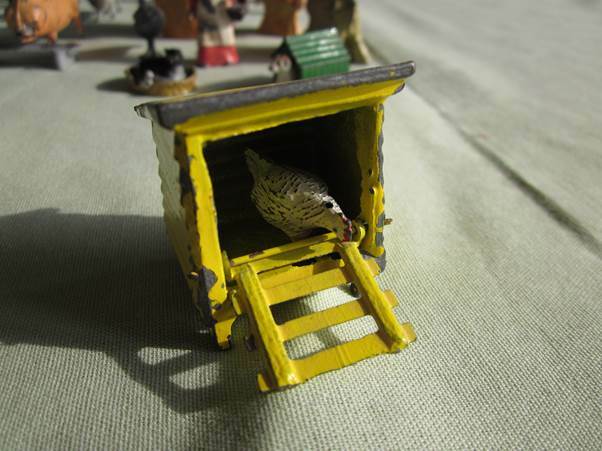 A hen has gone into a coop. It can be shut in to make it sit on a clutch of eggs and keep it safe. There are simple things, like a milk churn which still has its detachable lid. And here’s one for the historians. 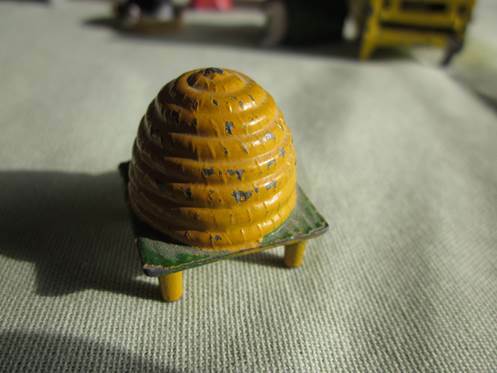 This is a bee skep made of straw in real life.. I have to say I have never seen a real skep in use. Hives, designed by humans for bees, allow for easier extraction of honey and far easier been inspection. My wife has a great little farm here. Tangmere is a small village in Sussex a mile or so east of Chichester, Nearby, in the Second World War there was a Royal Air Force base – RAF Tangmere. But sorry, folks, this post is actually about a steam engine and here it is. It’s an unusual looking loco and is seen here passing close by my house a few days ago. 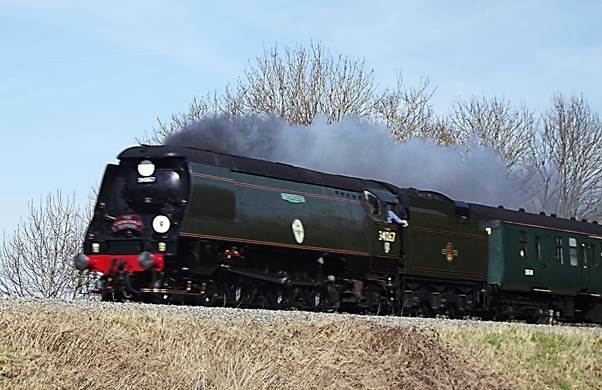 Tangmere was built during World War II and it seemed appropriate to name the engines after people and places significant during the Battle of Britain. As a result this class of engines was called the Battle of Britain (or BB for short) class. They are virtually indistinguishable from engines called the West Country (WC for short) class. This particular engine was called Tangmere. They look unusual and they were unusual in many aspects of their design. Oliver Bullied was responsible for these engines and he had trained under Nigel Gresley who designed such famous locos as Flying Scotsman and Mallard. But Mr Bullied was working under wartime constraints which dictated that express passenger locos were not to be built. The engines were supposed to be just as handy with a heavy goods train. All sorts of innovations were dreamed up to save weight (and therefore metal). The wheels were not spoked. Bullied came up with a lighter style. The mechanism for opening and closing valves to let steam in and out of the cylinders was chain driven. And for a touch of ‘glamour’ the boiler cladding was described as ‘air smoothed’ although many people called these engines spam cans. I note that in my 1962 shed directory this loco was based at Salisbury so it was in its one time home county as it rushed by on my local line. Many of these locos were rebuilt to look more conventional and also to change that chain driven valve gear – a good idea which suffered from oil baths which leaked oil onto rails causing engine wheels to fail to grip the track. In either form some survived to the end of mainline steam in the south in the summer of 1967. The twin villages of Alton Barnes and Alton Priors in mid Wiltshire are lovely little places. Whether your interest be thatched barns, ancient yew trees, Saxon churches (or a Norman one), modern glass engraving or maybe just really pleasant ambles in the countryside – the Altons have it for you. But my favourite are the delightfully chunky and simple turnstiles at field boundaries along the often cobbled footpaths. For me they are really lovely little mechanisms. They might be enough to stop a cow, but for a man with a dog these are very easy. There’s lovely for you – and so is the chap. He’s the husband of a distant cousin found through genealogical research. I’m going to start this post by looking at a tin. It is clearly old and well-worn which is not surprising as it belonged to my grandparents. 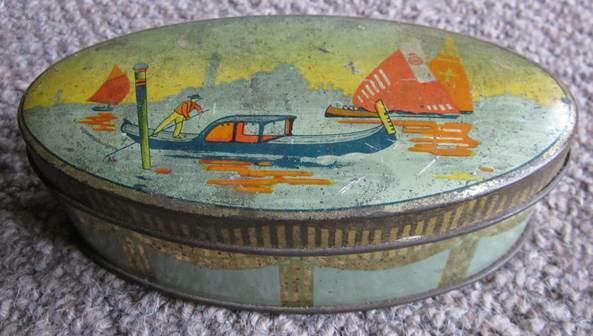 The tin was a Sharp’s chocolate or toffee tin. I do like the idea of the factory being the Kreemy Works which was at Maidstone in Kent. I’m afraid I can’t date the tin with any accuracy – but now we turn to the contents. This tin was where my grandparents kept tiddly winks – probably more than forty of them. We played occasionally using a table with a blanket on it as the surface. I recall that Grandad was much more skilled at it than me. The winks do not look like modern plastic ones with a totally uniform colour. They are Victorian and made of bone. 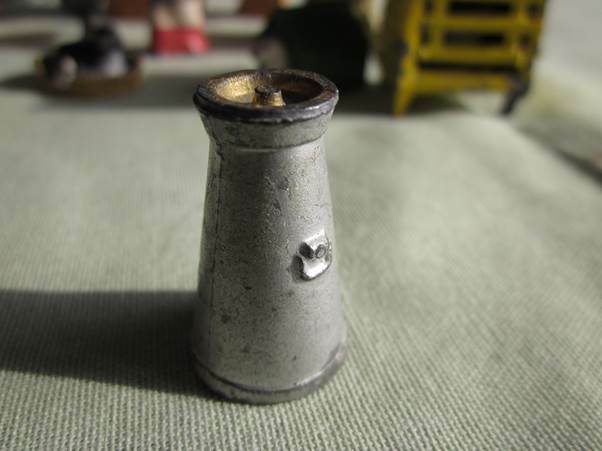 The cup is made of bamboo – according to the site at http://www.objectlessons.org/childhood-and-games-victorians/tiddlywinks-victorian-original/s67/a1071/ which I quote from below. Wealthy Victorian children amused themselves in their spare time with board games, dressing up and performing plays, playing word games and learning tricks. As well as playing traditional games such as draughts, dominoes and solitaire, children played newly invented games such as halma and tiddlywinks. The game of ‘Tiddledy Winks’, as it was known then, took off from 1890 onwards and continued as a craze for almost a decade. Tiddlywinks is a game for four players who play in two pairs. It would have been played on a table or the floor with a pot in the centre. Players used a larger disc called a squidger to flip the different coloured winks into the pot. The player who got most winks into the pot was the winner. The tiddlywinks set shown here is original. The pieces are made from bone and the cup is made from bamboo. Tiddlywinks is still played today. 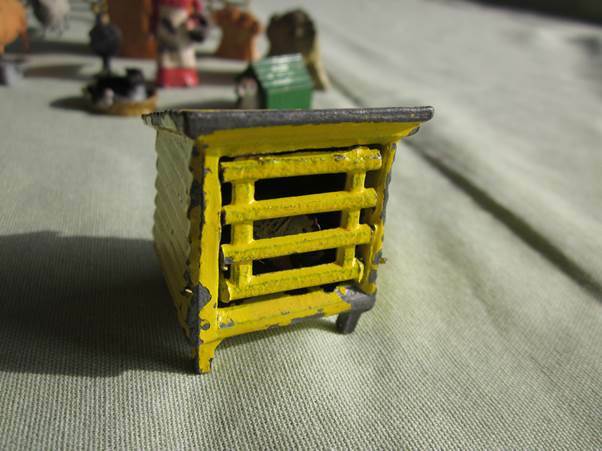 This web site also has a photo showing an original box. As you can see, it is the same set my grandparents had. was recently contacted by somebody else whose father served in the Faroe Islands during World War II. I was able to look at his photos, which made me think I should do another Faroese post. Midvaag is one of the villages on the island of Vagar. That was where many of the British troops on the islands were based. Nearby there was an area flat enough for a landing strip for aircraft and also a lake big enough for landing sea planes. 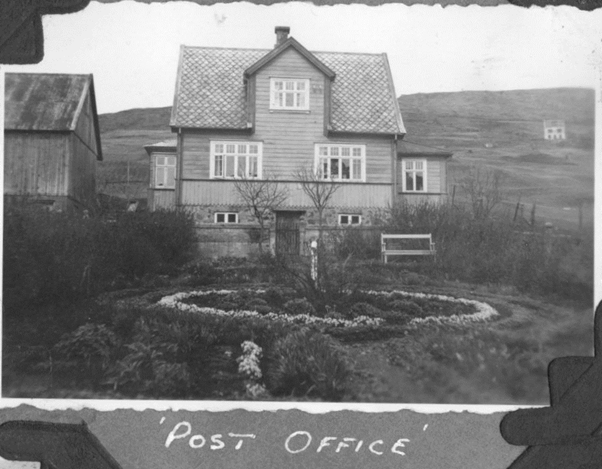 My father in law took a photo of the Post Office when he was based on Vagar in 1944/45. Father in law did a very good job captioning his photos. This image is clearly labelled as ‘Post Office’ and the whole page in his album is dedicated to Midvaag. You might note the two small trees near the post office door. Sixty years on, in 2005, they came to dominate the scene. Trees are a rarity on the islands but these two seem to have coped with the potentially wild weather of the North Atlantic. The local starlings thought these trees were a great place for a roost! That picture shows the top of our car as well. Back in 2995 it was possible to get a car ferry from a British port (Lerwick on Shetland) to Thorshavn, the capital of the Faroes. An undersea road tunnel links the island of Streymoy (Thorshavn is on that island) to Vagar. Let’s finish with another image of that Post Office.